Hi! I'm the great niece of Tech Sergeant James Van Ness. He was the Top Turret Gunner KIA on the B-24 Bomber Chug-a-Lug during the raid at Ploesti on August 1st, 1943. I came across your post on this forum from January 11th of 2004. I would greatly appreciate any information you can tell me. I have been trying to find pictures to no avail. My dad recently gave me the flag that was given when he died but I have nothing else. He's checking to see if there are any photos. But I would love to find some and as much information regarding my Uncle's brave actions. I appreciate any help or suggestions you could give me and even names of anyone who he served with who may still be alive. God Bless! Both photos are new to me. Thanks for sharing. I have a question about a plane who crashed near Dumbrava. My father told me that the a plane crashed near that hamlet and the pilot refused to surrender to the Germans. as a stand off was developing between the Germans and Romanian gendarmes the late king Michel arrived at the site and settle the dispute and the pilot ( who according to my father was using one of the turrets to keep the Germans art respect) agreed to be taken in Romanian custody. My father also use to say that the engines were still running and some German technician come and cut electrical distribution from spark plugs because the bomber was set to explode if the normal way to cut power was used. Also he said that the plane was taken and used by Romanian forces. As I was a little boy I didn't registered many information ( my father died 27 years ago) also I believed that it was just some urban myth. But it seems that some it is true. Can someone verify the story? My father was Hosea W Rich--co-pilot of the Chug-A-Lug which took that picture of the Sandman coming through the smoke, which the whole world has seen. The post shows Rich as KIA in 1944-- not correct. Dad come home after his required flights in the Fall of 1943. Pilot Morgan came back at the same time and both were actually from the same area of Riverside County in Southern Calif.
Hosea W Rich (dad) was then stationed as a flight instructor at Davis Monthan Air Base in Tucson, AZ. There he met and married mom--I was born seven years later outside of Los Angeles. Dad died in Norwalk, CA on 29 Nov 1962--at the age of 42 of a stroke and heart failure. I have an old photo album he kept while stationed in North Africa, prior to the Tidal Wave. I will look for those of Tipton and post. The event will feature “Knights of the Sky”, a documentary directed by Nicholas Dimancescu. The documentary “Knights of the Sky” is presented through the eyes and words of Nicholas Dimancescu. He journeys back to Romania both to uncover the stories of American and Romanian airmen who raided and defended Romania’s Ploesti oil refineries during World War II. The experiences of wartime fighter pilot ‘aces’ on both sides are recounted. Two of them, once enemies who attacked one another over Romania, meet for the first time 66 years later. Also told is the first-ever low-level “Tidal Wave” bombing raid launched from Libya against Romania’s oil refineries on August 1, 1943. Interviewed is the captain of the famed “Sandman” B-24. Looking around the internet there is a dearth of information on the 75th anniversary of Tidal Wave, with one known exception so far. If anyone knows of any Tidal Wave 75th information, articles, pics, whatever, please share here. 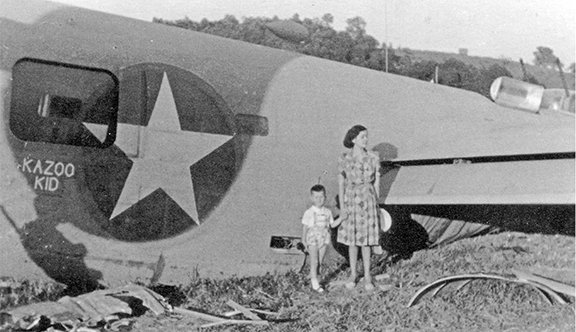 Anyway, see article titled "Remembering Operation Tidal Wave at 75 Years – Oregonians in the Low-Level Mission against Ploiești, 1 August 1943" at link below. One caption for one of the images is wrong and needs to be corrected.